Apple Inc. (AAPL.O) is widely expected to enter the highly competitive video-streaming market at an event on Monday, but Wall Street could react to the news with yawns. The announcement -- which will detail a plan that Apple has been dropping hints about for weeks -- is unlikely to be a game changer for Apple or its competitors, according to analysts who said it would be hard for Apple to match video-streaming rivals in the breadth of original content it offers. And because it will represent such a small part of Apple’s own business, the event may not have much impact on its stock price. John Butler, an analyst at Bloomberg Intelligence, said Apple’s move is unlikely to pose a near-term risk to the biggest streaming companies. Both Apple and Netflix have been strong performers in 2019. 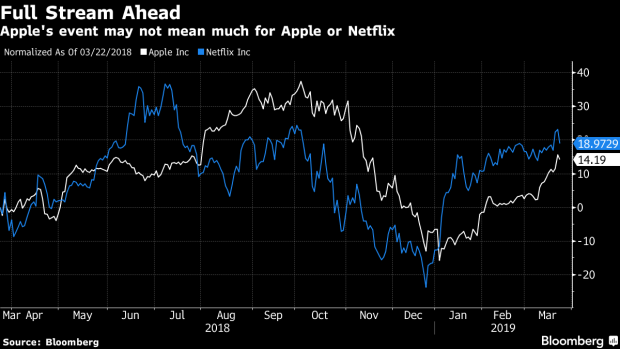 Shares of Apple have gained 23 percent this year, while Netflix has surged more than 35 percent, although both remain below record levels hit last year. One company that could see some upside from Apple’s entrance into the sector is Roku Inc., which provides a platform for different streaming services. Needham analyst Laura Martin recently named Roku her top pick for 2019, in part because she expects Apple “will add any new streaming TV services to Roku” along with revenue sharing terms, as it looks to make its subscription services available to all customers.